The 2018-2019 school year marks Bishop Kenny High School's 67th year of service to the young people of Northeast Florida. Since its founding in 1952, Bishop Kenny has earned a proud reputation not only for academic excellence and a winning athletic program, but also for the many ways that Bishop Kenny students reach out in service to the community. We are proud of our history and traditions but more importantly, we celebrate our commitment to the Gospel values that are the cornerstone of all that happens on our campus each day. Guided by the lessons of the Gospel, Bishop Kenny graduates will be persons of integrity, capable of making life-decisions and positive contributions to their faith, family and global communities. Bishop Kenny High School is located on 55 acres of property that was once the site of Fort San Nicholas, a Spanish fortress (1740-1817). The property also served as a shipyard during World War I. After coming into the hands of the Diocese of St. Augustine, it was determined that it would be the ideal site for a Catholic High School designed to serve approximately 400 students from Jacksonville and surrounding areas. 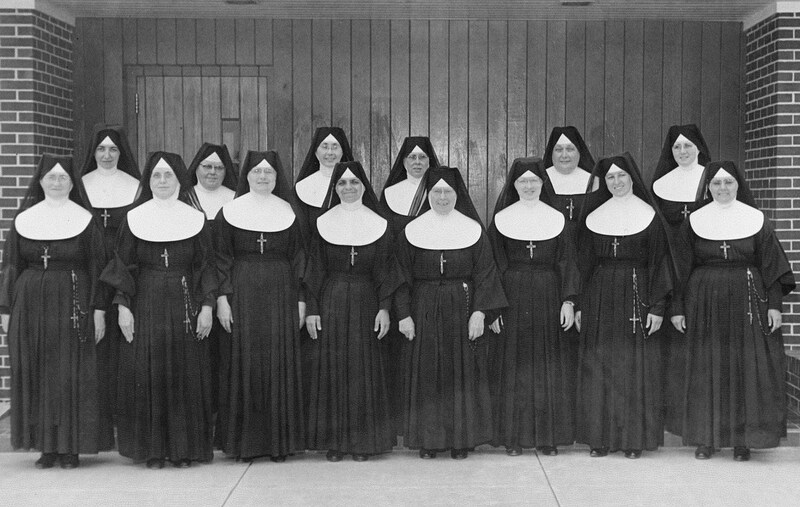 In 1952, Archbishop Joseph P. Hurley, with the help of the Catholic Community in Jacksonville, initiated the consolidation of three Catholic high schools to form one diocesan high school. The doors to Jacksonville’s Central Catholic High School opened on September 3, 1952. The school was renamed and dedicated later in that same school year in honor of Bishop William J. Kenny, the first American-born bishop of the Diocese of St. Augustine. The original school, which consisted of an administration building, a classroom wing, and locker room facilities, located adjacent to the present gymnasium, was built at a cost of $782,500. Today Bishop Kenny High School's facilities are built to easily accommodate our current population of 1210 students. Sister Jane, to you and the many Sisters of your community who have served here for six decades, since this school’s founding, we are grateful to you and give thanks to God not only for the Sisters’ dedication and service, but also for the mark each one has left on the school and its students and its mission – but even more importantly, how your community has set God’s own seal upon this school, its mission, and its future – a seal that will guide it forevermore. I believe strongly that those people and places where God has sent his religious, whether for a short while or a long time, that those people and places have been extraordinarily blessed. Those people and places have had in their midst, sent from God, religious who because of their vows and the example of their consecrated lives have taught them the most important of life’s lessons – how to lead this life with hearts, eyes, and minds firmly set on the life of the world to come. Today there are nearly 16,000 graduates of Bishop Kenny High School. Our alumni live in virtually every state in the union and in countries all over the world. A large majority of graduates remain in Jacksonville and many choose BK for their children’s high school education. This year alone we have nearly 200 legacy students coming from second or even third generation BK families. After the school day ends, our students are still in action. The boys’ and girls’ Crusader athletic teams are always competitive and it is not unusual for them to bring home any number of district, regional, or even state championships each year. The Campus Ministry program is a lively and important part of campus life helping encourage and coordinate a Christian Service Program that results in an estimated 50,000 hours of community service annually. Our students reach out to every corner of the community and make a difference in the lives of the people who live there. Bishop Kenny High School has been accredited without interruption by the Southern Association of Colleges and Schools since its founding. Each year 99% of Bishop Kenny graduates go on to college armed with millions of dollars in scholarships and, in surveys, our alumni rate their preparation for college as excellent. Since 1952 the Bishop Kenny facilities have grown to accommodate a steadily increasing student population, an expanded curriculum, and an award-winning athletic program. The following is an overview of many of the improvements and additions that have been made to the BK campus over the past 65 years.